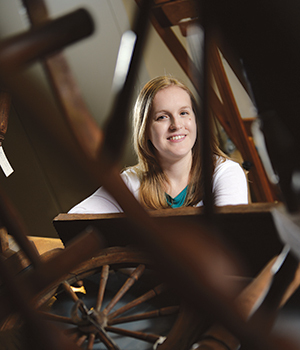 Deep beneath the State Historical Museum sit tens of thousands of artifacts from Iowa’s past. Meet the people who preserve and protect them. 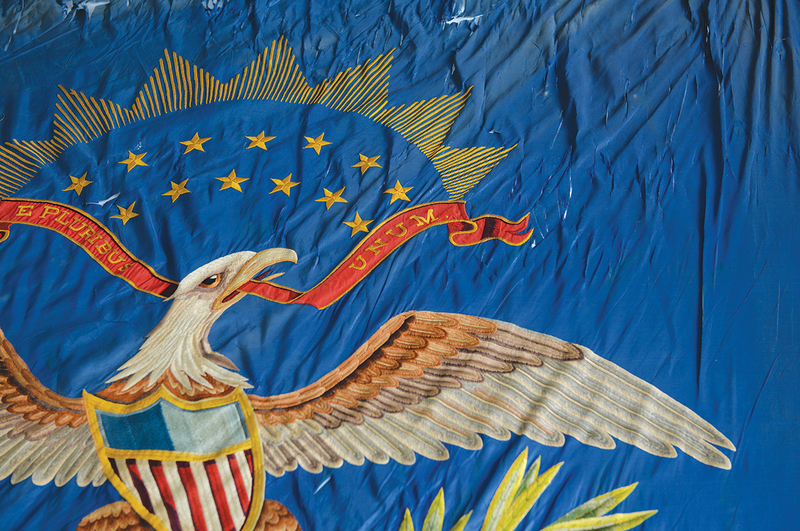 Above: An embroidered eagle adorns a silk flag the Fourth Iowa National Regiment flew in the Spanish-American War. Most flags are stored flat, in big drawers, to minimize deterioration. 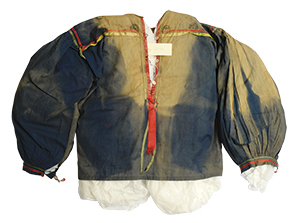 Long-term exposure to light faded the collar and sleeve of this Meskwaki shirt made from blue cloth and decorative ribbons. It’s now tucked safely away in storage and displayed only for short periods of time. Standing in a climate-controlled basement 30 feet underground, Kay Coats is lamenting the sun. As the collections coordinator for the State Historical Society of Iowa walks from one side of a softly lit, cavernous room to the opposite wall, the ephemera of Iowa’s past crowds in: Shelves filled with radios and war banners and street signs. Containers of Tone’s spices and Big Daddy’s Bar-B-Q Sauce. A corner housing 100 years’ worth of automobiles. An entire 60-foot aisle filled only with televisions. She pulls open a thin sliding drawer to reveal a delicate Meskwaki tribal blouse (pictured, right). Made around the turn of the 20th century, the blouse was once a brilliant, deep blue, but it weathered and faded to a dusty brown in spots. Modern museums are climate-controlled, LED-lit palaces devoted to keeping memories as intact as possible, but for a long time something as basic as light exposure was left unchecked. The blouse, for example, was brought into the collection, put on display, and simply left there for years. 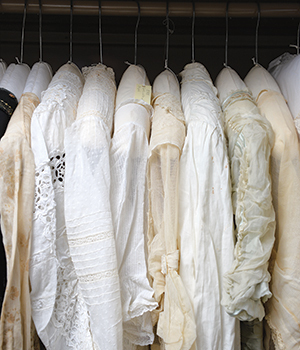 Delicate cotton dresses from the 1910s line a storage rack at the State Historical Museum. The blouse was on display in the Historical Society’s previous home before moving in 1988 into its current building in Des Moines’ East Village, which boasts 40,000 square feet of exhibit space. But deep beneath the museum sits a storage room the size of a city block that houses more than 150,000 artifacts from Iowa’s history in a sprawling maze of climate-controlled hallways, cabinets and drawers. And all that history rests in the dedicated hands of a few passionate caretakers, charged with identifying, preserving and showcasing the state’s relics—209 million in all—that tell the stories of our lives. Most of those 209 million items come in the form of printed pages: Manuscripts, library collections, newspapers and letters account for 99 percent of what the Historical Society houses and preserves, most kept in the state archives and historical libraries. 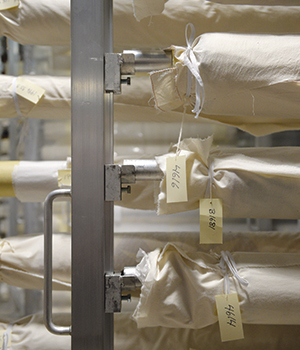 Quilts and sturdier textiles are stored on rolls to save space. Bolstered by a team of volunteers, the preservation of Iowa’s physical history falls mainly on the shoulders of people like Coats, exhibitions manager Andrew Harrington and state curator Leo Landis. 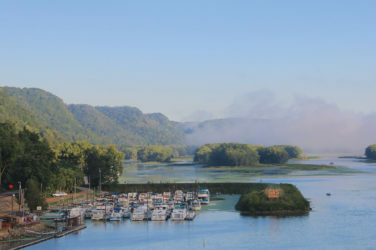 Each serves a vital role in identifying the important pieces of Iowa’s past, maintaining the state’s collections, and putting those artifacts on display for the public. To that end, the first step in the Historical Society’s mission is collection. Many are donated items, some that have—literally—been left on the Historical Society’s doorstep. Iowans find things in their attics and basements, in grandparents’ scrapbooks, in barns and thrift stores. And every year they bring hundreds of those items to the museum. Most are rejected, due to redundancy in the collection or the condition of the item. The biggest reason for a donation to be turned away is one of commonality. There are only so many 1920s-era toasters or 1890s spinning wheels a museum needs, and the Historical Society is stocked up on both. But while the current collection boasts dozens of examples of war ribbons, highway signs and home appliances, there are also one-of-a-kind irreplaceable treasures, making their continued preservation all the more important. As the collections coordinator for the state, it falls to Coats to oversee the slightly more than 30,000 square feet of storage space that sits underneath the Historical Museum and its 40,000 square feet of additional exhibit space. Keeping tabs on 150,000 different artifacts can be daunting, even without taking into consideration the fact that the collection has never been fully inventoried and catalogued, something Coats has spent most of the past five years trying to correct. 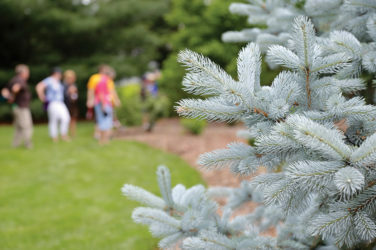 By her estimation, only 20 percent of the state’s physical collection has been properly photographed, itemized and cataloged. Upstairs in the document archives, that number is closer to 10 percent. But the state doesn’t collect items simply to hoard them in a cellar. The point of preserving these items and the stories they tell is to share them with the public and help keep those moments, frozen in time, accessible today. That’s where Andrew Harrington comes in. 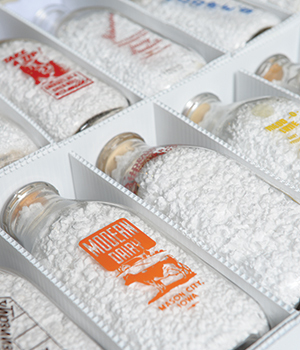 Milk bottles stuffed with packing material in a drawer. As the exhibits manager, Harrington works closely with Landis and Coats to identify stories the museum wants to spotlight, and the items needed to tell them. 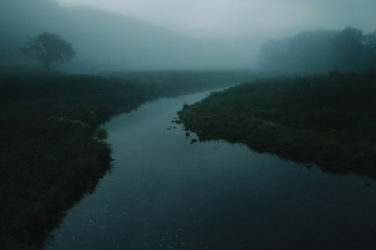 Harrington also thinks about how the flow of each exhibit will direct a visitor’s attention. Not only will the path taken through an exhibit help shape a person’s impression, but something as subtle as lighting or color scheme can help set a particular tone. In the museum’s Civil War exhibit, for example, the walls were painted different colors to separate the topics being covered—red walls for the battles, blue and gray for the army encampments, yellow for the home front. When an exhibit is being put together, several factors must be taken into consideration. Paper and textile artifacts, for example, can only be displayed for short periods of time to protect them from light damage. Coats points to the state’s collection of Civil War battle flags as an example of what happens when things are stored improperly. 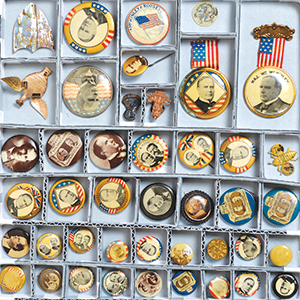 Campaign buttons from the 1890s stored in a custom-made cardboard tray. Shortly after the conclusion of the war itself, the battle flags of the various Iowa volunteer regiments were put into the Armory building for storage. After being kept there for 30 years, they were taken up the hill to the Capitol in 1894, where they were hung upright on their poles in the rotunda until 2004. “This is what happens to silk when you leave it in an uncontrolled environment for 100 years,” Coats says, pointing to the great gaps in the tattered ends of a flag for the 3rd Iowa Veteran Volunteers. Now residing in giant pressure frames behind UV-resistant glass, the flags were treated with a special sheer polyester fabric called Stabletex, used to hold the delicate, tattered pieces in their original places. Conservation work is intensely detailed, time-consuming and vital for any endangered textile to extend a garment or document’s life by decades. Therein lies what may be the Historical Society’s greatest daily obstacle: The state of Iowa currently has no conservator. Until 2017, that position had been held for 25 years by Pete Sixbey. When Sixbey retired in October 2017, the void left behind was large. Neither Coats nor Landis knows for certain when or even if the state budget will provide enough money to hire another conservator. Often, that has required Coats and Landis to rely on their collected practical experience to pick up the slack. But just as often, that means that an item needs to be sent out to a private contractor for a restoration process that can take years. As with any organization whose budget is assigned by the state, money will always be tighter than the people in the trenches would like. For as long as there have been governments, there have been people told to do a dollar’s worth of work on a dime’s budget. But the effort continues because for people like Coats and Landis and Harrington, there’s more on the line than just a paycheck. They are the custodians of our memories.